The Horan party from Reno, Nevada, had some great fish action in June. This grandfather-father-two son team fished 3 days at Eliguk Lake and 3 days at Moose Lake. Their total catch and release was a whopping 333 rainbow trout, with the largest weighing in at 3 1/2 pounds and 24 inches. The sons outfished the fathers… catching 104 and 103 fish (centurions). Not only was the fishing great, but they had excellent sunny weather. We challenged them to come back next year… Stewart’s Lodge 50th Anniversary …and have a 50 fish day! Cool temperatures until early June slowed fishing in Nimpo Lake, but the subsequent and abrupt transition from winter to summer brought about immediate chironomid and mosquito hatches. Fishing steadily improved, and even the Stewart’s Lodge chef (Richard Caruso) began catching fish… these 17 to 18 inch rainbows were picture perfect! We advised Tony Trambitas from Olympia, Washington, not to go into Toms Lake, because nobody had caught anything notable yet. But, he insisted, and it paid off. Tony caught 15 to 20 fish and kept the two biggest… two beautiful rainbows, both over three pounds. His dog Sweetpea, who accompanied him, was apparently not all that impressed. But those of us at the Lodge who saw the results were very impressed. High water levels in both the Upper Dean and Blackwater rivers made for difficult fishing when these streams opened on June 15th. However, an old pro fisherman from Victoria, BC… John McEown …and his Stewart’s Lodge guide… Kevin Mayer …persisted, and were rewarded with some modest catches. As the water levels dropped, it was great action. 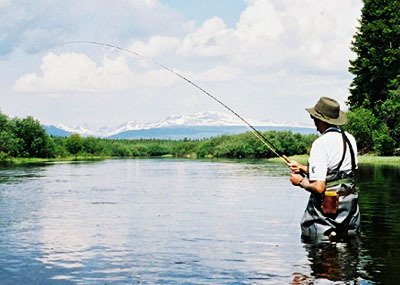 WILDERNESS TROUT FISHING… the angles are awesome!